Seven circles in mature red wheat were found by the farmer on Sunday September 16 while he was harvesting. The formation was not in the field September 1 when the field was sprayed with a desiccant. There is a report that the formation was spotted from the air on Sunday, Sept. 2. If that is so, then the formation was made during the night of Saturday, September 1 / Sunday, September 2. Total width of formation is 422 ft (128.6 m). I visited on Tuesday, September 18. The crop was fully ripe and plants were very dry and brittle. Many people had already walked through the formation. MEASUREMENTS AND CROP LAY, including a perspective distortion of the aerial photo above. Take a close look at some of the circles. Center circle panorama, larger version (152 kb) or smaller version (41 kb). These panoramas are made from several images joined together. Distortion is due to the wide angle lens I used. Paths were about three feet wide. The lay in most paths was fairly neat. One path meandered quite far off course and I couldnt get a sight-line down the length of the path. Other paths were very messy with plants bending sideways and not completely flattened. It looked like the plants were knocked down at an angle of about 45 degrees to the direction of the path. This is the central whorl of the north east circle. Although the lay within the circles was quite uniform, occasionally the edges were messy and knocked over. On close inspection, some central whorls were indistinct. In some circles we had trouble locating the central whorl because the plants were splayed out at odd angles, not neatly spiraled. The laid plants throughout the formation were bent over at varying heights ranging from ground level to 3 inches from the ground, even within the same clump of plants. The farmers say they didn't see any broken seed heads or stems when they first entered. However, when the formation was made, the plants were probably damper and more flexible than they were when I visited. The plants stems within the circles were very straight. In an admittedly quick visual inspection, I found none of the node changes, bent nodes or bundling that would associate it with the rapid flash of heating that seems to create crop formations of unknown cause. I enjoy studying the geometric relationships found in crop formations. Here is my analysis. Many people who see crop formations say, "What does it mean?" Some try to find a link with this formation and the recent terrorist attacks in the United States. Many see the Star of David, a symbol of Judaism. Christians have various interpretations depending on their own belief system. Some find reassurance that a higher power is keeping a watchful eye on us. Some look for similarities with aboriginal motifs. The lovely rolling hills to the east of the formation were once Blackfoot Indian lands. Did the Blackfoot conduct spiritual ceremonies there before European settlers took the land for agriculture? 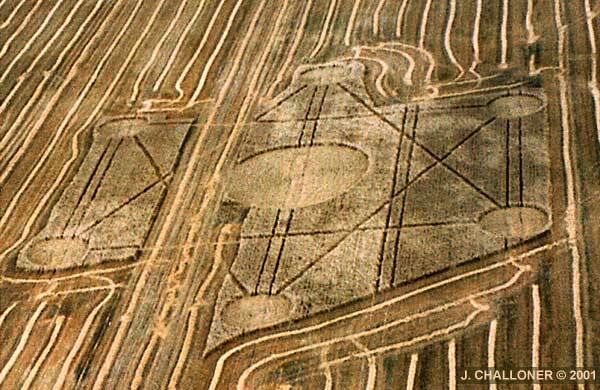 People with a leaning towards New Age beliefs may see this as a message from Mother Earth or Gaia. This design has a strong similarity to star tetrahedron diagrams and Metatron's Cube in the Flower of Life teachings. If you're interested in UFOs, you may make a connection with recent sightings of triangular formations of peach colored lights over the nearby town of Lacombe. People who are interested in labyrinths are delighted at all the possibilities to explore the geometry by walking through it. Is this a human artistic expression? Red Deer College has a fine arts program, including summer arts programs. I think crop art would be on the minds of at least some students in this farming community. It doesn't matter to me if we solve the puzzle of who made it. People respond to the beauty and geometry. After the horrific images we've been viewing on TV this month, walking in the serenity of this crop formation is a soothing balm.